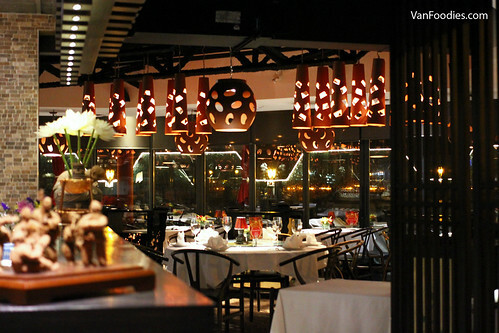 « Dine Out at the Oakwood Canadian Bistro – A Shout-out to the Beer Club! 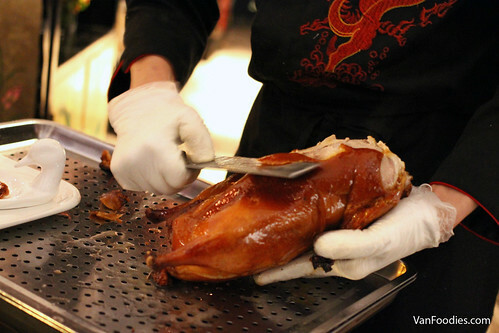 Usually for Peking Ducks, restaurants would just skin the duck and serve it with crepes, etc. 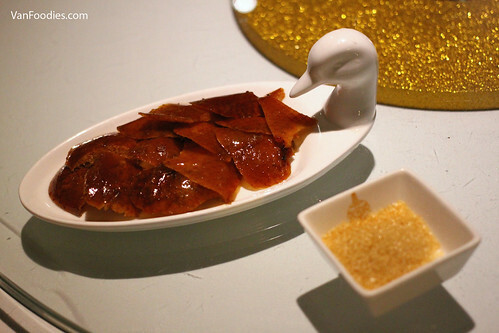 Here they actually serve the skin two ways: first of all, they serve the crispiest part of the skin, and skin only with just a thin layer of fat, and you dip it in brown sugar. Wow this was really good. The warmth of the duck skin melted the sugar as you dipped into it; the sweetness and fattiness melted right into your mouth, and for some reason it didn’t feel greasy at all. An interesting take, and I think it’s a simple yet very clever way to enjoy the crispy skin. 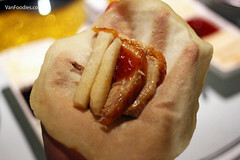 The second way was to serve duck meat with hand-made flour wrappers. This was done the Northern Chinese way, with a higher meat to skin ratio than most other Chinese restaurants in Vancouver. The crepe wrapper was very well done, so thin that I can see my hand through it. 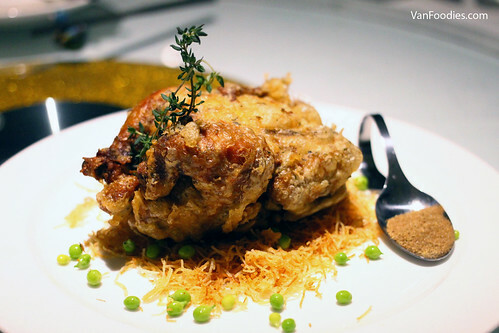 The duck skin was still crispy, and meat was tender and flavourful. I could totally eat the meat on its own. 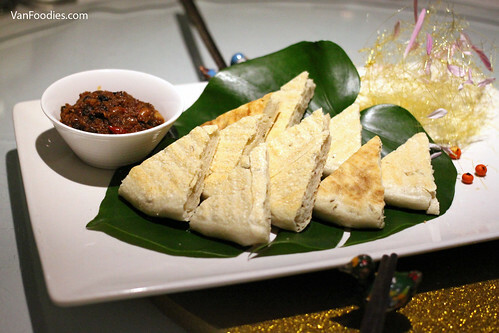 To put together the wrap, we were given hoisin sauce with cucumbers & scallions, and strawberry sauce with pears. The hoisin sauce with cucumbers & scallions was definitely the more traditional way of a duck wrap, and it tasted excellent. The strawberry sauce & pears was also not bad, although it may be a bit too sweet for my liking. Next was a platter of appetizers. The Tossed Cilantro, Scallion & Red Peanut Salad 陕西大拌菜 seemed simple, but it was herbaceous and had lots of flavours; Marinated Mushroom 迷你小香菇 was tender, but they were served cold; Crispy Beef Tongue 脆皮牛舌 had good, crispy breading, but the meat was too tender, almost a mushy texture; Honey Grapefruit Spare Ribs 西柚蜜汁糖醋排 were tender and I could taste the combination of sweet and sour, as well as citrusy flavours. 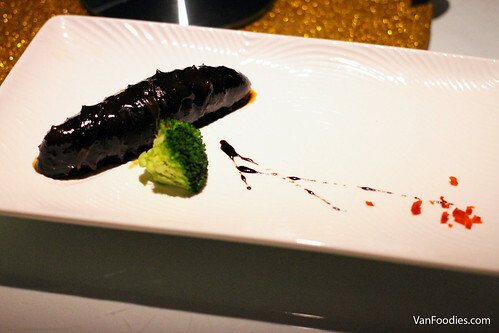 Next course was the luxurious Braised Sea Cucumber 長安蔥燒海參. It may not look the prettiest on the plate or in photos, but don’t judge it by the cover. One of these costs $50 at the restaurant! 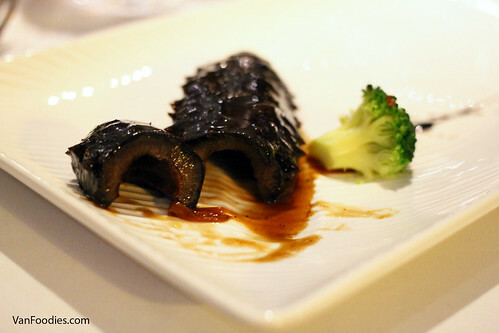 Sea cucumber is a delicacy in Chinese cuisines. This was braised for 48 hours with 20 different herbs and spices. 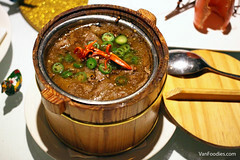 The braising process allowed the sea cucumber to soak up all the flavours in the braising liquid. This sea cucumber was tender, gelatinous, yet still bouncy in texture. This was very well done. 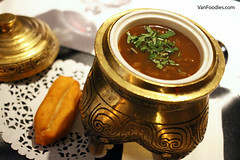 The Imperial Hot & Sour Soup 回坊酸辣湯 came in an individual golden pot – what a great presentation! 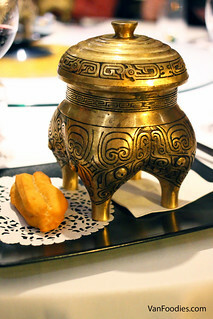 It’s served alongside a piece of Chinese donut. At first I thought it’s a congee, but it’s soup! The Chinese donut wasn’t the typically Chinese donut 油條; it’s more dense, more doughy, but it actually worked for dipping in the soup. The soup had a nice kick! It had a great depth of flavours. The dark vinegar really came through, then there’s ginger, white pepper, and a burst of freshness from the cilantro. The big prawn in the soup was cooked perfectly with great texture. That being said, it was quite spicy for my tolerance and I just couldn’t finish the whole pot. 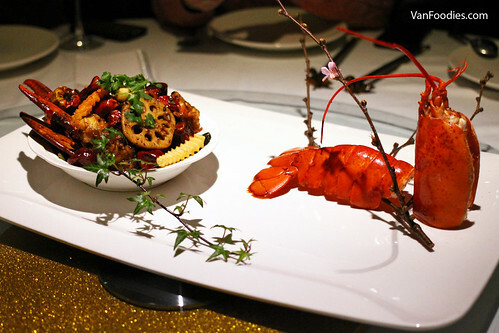 Relatively speaking, the House Special Fried Chili Lobster 香辣龍蝦 had just the right amount of heat from the chili peppers. The lobster was tender and flavourful, but there wasn’t much to go around. With the 10 of us, we each got one piece for sure, and only a few people got a second piece. 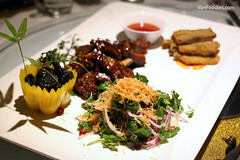 What made up the rest of the plate was fried chili peppers, lotus root slices, and crinkle fries. The lotus root was nice and crunchy, but the crinkle fries had no place in this dish. They looked like they came from a frozen pack and were fried up for the plate; aesthetically it looked out of place and textually or flavourwise it also didn’t match. 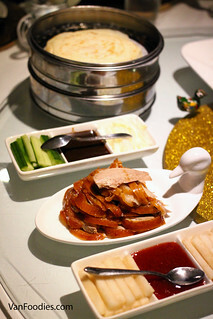 When the Szechwan Peppercorn Sliced Beef 鮮椒木桶肥牛 first arrived at the table, I thought it’s tofu pudding! Not quite time yet for dessert. This was probably one of the more simpler dishes on the table, but it was executed quite well. 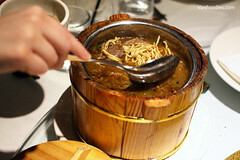 The Szechuan peppercorn came through, and I could feel the tingling, numbing sensation after sipping the broth. The sliced beef was tender and there was a generous serving of tofu skin noodles. A hearty, comforting dish. The Chang’an Gourd Chicken 長安一品葫蘆雞 was excellent! 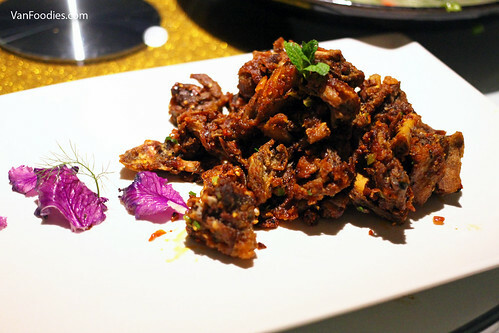 The exterior was crispy; meat was juicy, succulent; bones were fried up to the point they almost melted in your mouth. It’s kinda too bad that we had it so late in the dinner, I was too full to fully enjoy this. 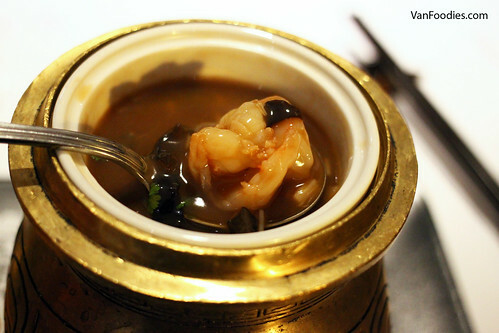 There’s a good combination of flavours and texture in the Sweet & Sour Lychee & Prawns 貴妃荔枝蝦球. The lychee was breaded, fried, then cooked in the sauce, so the sweetness in the fruit was perfectly coated with the sourness in the sauce. 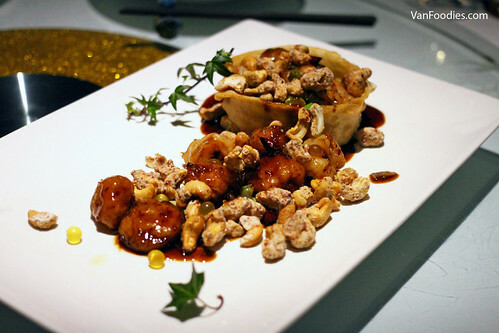 Soft lychee pieces were also contrasted with the crunchy cashew and prawns. Perhaps the dish could use a few more pieces of prawns; I thought it got lost on the plate. 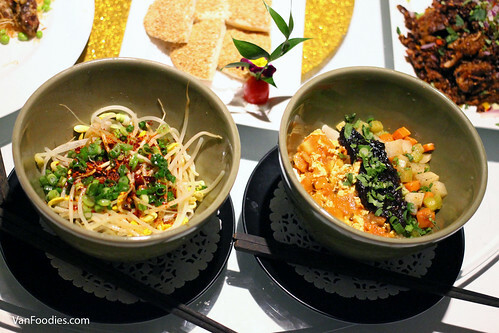 Biang Biang Noodles 油潑辣子麵 (left) was made with Shanxi special hot chili sauce. The noodles had good texture, and overall not overly spicy. The Three Sauce Noodle 三合一臊子扯麵 (right) had minced beef, tomato, egg, celery, carrot, potato and tofu. It reminded me of the Fried Sauce Noodles (Zha Jiang Mian 炸醬麵) from Northern China. 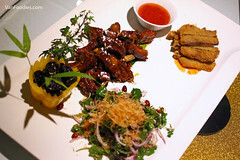 The Qin Style Roast Lamb Leg 秦味烤羊腿 had prominent cumin flavours. The meat was a bit too dry for my liking. The sesame pocket was crispy and flaky. The Braised Whole Chili & Spring Onion Cod 蔥椒魚 was another one of my favourites this evening. The cod was silky, tender, flaky, skin gelatinous. 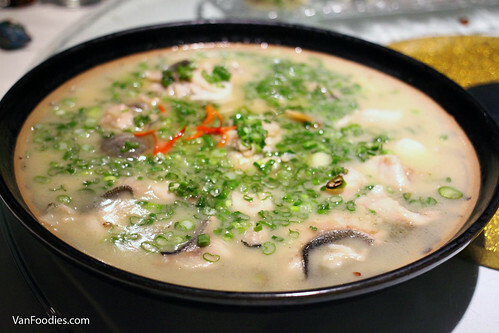 The broth was full of fish flavours; it was probably made from the fish bones, hence giving the broth a creamy colour. The soup was slightly spiced, which warmed you right up on a cold winter day. I was pretty full by this point, but I couldn’t help it and get myself another serving! 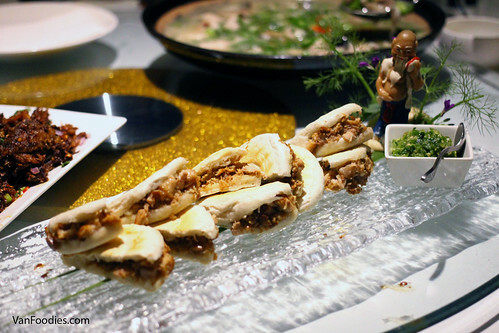 The pork in the Pork Belly Mini Sliders 老陝臘汁肉夾饃 was stewed in slow heat in an aged sauce consisting of over 20 spices and ingredients, such as clove, nutmeg, ginger and cooking wine. It was juicy, slightly fatty, flavourful, a good Chinese take on the western style pulled pork. The meat to bun ratio was just right. Finally, a veggie dish! 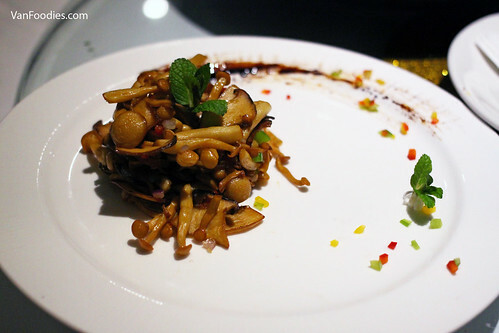 The King Mushroom Casserole 石板菌菇 might not have any sauce, but the flavours were all there. There’s a good balance of acidity (from dark vinegar) and savoury. Mushrooms were tender, slightly crisped up around the edges from the cooking. The portion was not very big here, so on a regular day I could probably finish the whole plate. I love mushrooms! 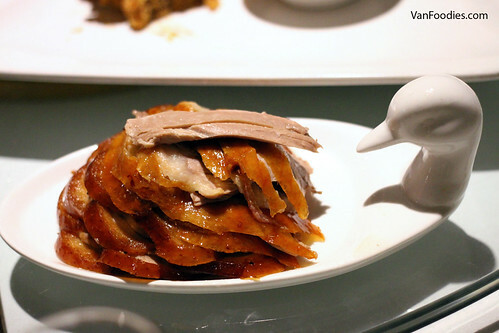 The 2nd course of the Chang’an Roasted Duck was the 5 Spice Duck Ribs 椒鹽鴨架. You could order the Noodle in Duck Soup instead, if you want. But I would recommend getting the duck ribs. It’s slightly crispy on the outside, well seasoned with the five spice. I personally enjoy the process of peeling meat out of the bones, so this was a very enjoyable dish for me. 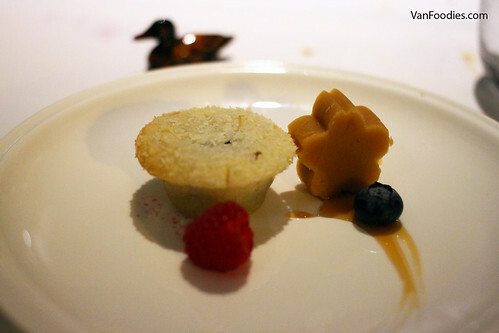 Lastly, some dessert to wrap up our dinner: Red Bean Cake 紅豆年糕 (left) and Yellow Bean Cake 豌豆黃. To be honest dessert isn’t their strong suit as neither dessert was outstanding in my book. Relatively speaking the yellow bean cake was better. It wasn’t a very memorable finish to the meal. As you can see, it was a long yet satisfying dinner for us. 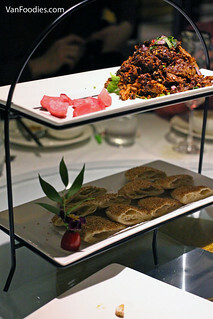 Many dishes were done quite well, but they are also priced at a relatively higher price point. It’s not your everyday Chinese restaurant, but for special occasions, I think this is worthwhile for a visit.